The US military has rescinded an order to its personnel to avoid London in the aftermath of the bombings. Personnel, most of them from US Air Force units at RAF Mildenhall and RAF Lakenheath, in Suffolk, were told last week not to go within the M25 motorway. But there was criticism that it sent out the wrong signals at a time when the emphasis was on "business as usual" in London after the attacks. The US embassy said the order had been reviewed and had now been lifted. The Commander of US Forces in Europe, General James L. Jones, based at Mons in Belgium, said in a statement: "[We have] lifted all travel restrictions for US personnel stationed in the United Kingdom. "While all personnel are encouraged to be vigilant, we cannot allow ourselves to be intimidated by the acts of terrorists. All US personnel are encouraged to continue with their normal routine." 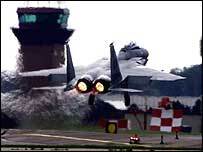 Most of the 12,000 US personnel in the UK are based at Mildenhall and Lakenheath. The US air force had said the order had been made in the interests of the safety of its personnel. "We're truly sorry, we feel badly for you all and we will continue to stand side by side you as partners in the war on terror." The prime minister's official spokesman described the ban as "a temporary measure that has been reviewed". Defence Secretary John Reid told BBC News he had been "trying to get to the bottom of this". But he emphasised that the decision was taken locally in the immediate aftermath of the bombings, when many companies were telling staff to stay out of central London because of the confusion and the need to leave emergency services unhindered. Lieutenant Gloria Smith, based at RAF Mildenhall, said: "It's just a prudent measure, it's normal procedure any time there's such an incident. "Our presence in Great Britain is our voice of saying we stand with the British people. We have a long historic relationship and we will stay here to stand by the British people." US Charge D'affairs David Johnson said the embassy was advising Americans to go about their business as usual in London. "You should be aware of your surroundings and that's what we're telling people who work in our building, that's what we're telling American citizens who inquire of advice from us." Conservative defence spokesman Andrew Robathan said: "I suspect that this was a decision made when London was not a place to visit, on Thursday and Friday. "I also suspect it was a decision made by somebody who was rather risk-averse - perhaps a middle-rank commander, not one of the top people."